δ is a function from Q x ∑ into Q called the transition function of M.
The finite automaton starts in state q0 and reads the characters of its input string one at a time. 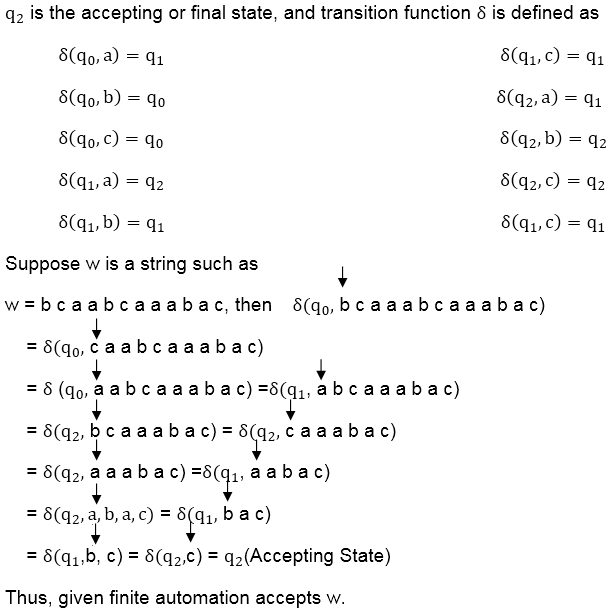 If the automaton is in state q and reads input character a, it moves from state q to state δ (q, a). Whenever its current state q is a member of A, the machine M has accepted the string read so far. An input that is not allowed is rejected. A finite automaton M induces a function ∅ called the called the final-state function, from ∑* to Q such that ∅(w) is the state M ends up in after scanning the string w. Thus, M accepts a string w if and only if ∅(w) ∈ A. The primary loop structure of FINITE- AUTOMATON-MATCHER implies that its running time on a text string of length n is O (n).